SBI Mutual Fund Bandhan SWP - Should You Invest? Home » Mutual Funds » SBI Mutual Fund Bandhan SWP – Should You Invest? SBI Mutual Fund Bandhan SWP – Should You Invest? SBI Mutual Fund Bandhan SWP is an innovative way to gift money to your family member. 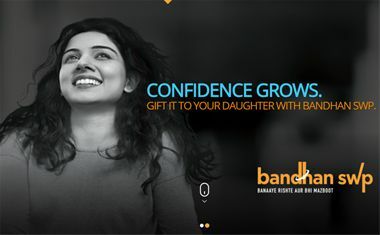 If you are looking for income solution for the family which generate a regular cash flow in a tax-friendly manner, you should defiantly consider SBI Bandhan SWP. SBI Bandhan SWP has a beneficiary feature which allows you to create an income stream for your family members. What is Systematic Withdrawal Plan (SWP)? What is SBI Mutual Fund Bandhan Systematic Withdrawal Plan (SWP)? How do SBI Bandhan SWP works? How to Start Bandhan SWP? What are the benefits of Bandhan SWP plan from SBI? Let’s try to find out. Systematic Withdrawal Plan allows an investor to withdraw from a mutual fund scheme at regular interval. This could be monthly, quarterly, half-yearly or annually. The withdrawal can be fixed or variable. This helps an investor to generate regular income flow. E.g You have 5000 units in your MF scheme and you have given instruction to fund house to do SWP of Rs.1000 every month. This means every month based on NAV applicable equivalent number of MF unit will be sold and Rs.1000 will be credited to your account. What is SBI Mutual Fund Bandhan SWP? SBI Bandhan SWP is like plain vanilla Systematic Withdrawal Plan, with a twist of crediting withdrawal amount to the family members (parents, sibling, spouse or child) bank account instead of your account. The money transferred to a family member is treated as a gift in case of Bandhan Systematic Withdrawal Plan. As per current income tax law, there is no gift tax if any money is received as a gift from a relative. This means no tax is applicable for the beneficiary. An investor needs to bear short-term capital gain tax if withdrawals are made in the first year of investment. Long-term capital gain tax is applicable if withdrawals are made after the first year. Exit load is also applicable. How does SBI Bandhan SWP works? Suppose you have 1 Lakh balance in your mutual fund and you opt of Rs.5000 as SWP amount from March 2018. Taking hypothetical example here is how SWP will work. If you are an existing investor of SBI Mutual Fund Growth Plan, you can avail SWP facility of Bandhan just by giving beneficiary detail. If you want to start a new plan, follow the steps given below. Invest in SBI Mutual fund scheme growth option. A scheme should be open-ended. After few months or years opt for SWP facility. Specify beneficiary details, withdrawal amount, time period and other details. Please note that beneficiary should be Indian resident and immediate family member of the investor. KYC documents of the beneficiary, including proof of the relationship between investor and beneficiary needs to be submitted. Also, provide cancel cheque copy of beneficiary account for SWP transfer. The beneficiary account will get credited as per specified amount at a specific time interval. What are the benefits of Bandhan SWP plan from SBI? The first benefit of this plan is regular cash flow to your loved ones. You can take help of this plan to fulfill a financial need of your family member which demands funds at fixed intervals. This could be pocket money for your children or regular monthly income to your parents after retirement. 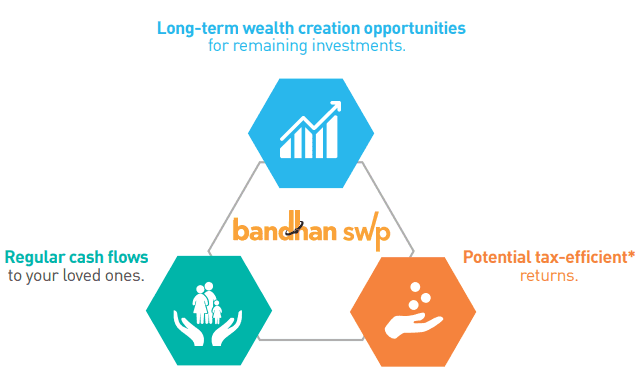 As discussed earlier Bandhan SWP is a tax-efficient solution for the beneficiary. The fund transfer to a family member is considered as a gift and no tax is applicable to the beneficiary. If a received amount is invested again, the interest income will carry tax liability. This new SWP not only provides regular cash flows and tax benefit but also gives investors long-term wealth creation opportunity if invested in right growth SBI mutual funds. When can you opt for SBI Bandhan SWP? SBI Bandhan SWP makes clever use of gift tax law. It also provides control to the investor. You should opt for SBI Bandhan SWP when you are looking for regular income option for your family member. Few examples are given below. To provide pocket money or monthly expense to your son/daughter when he/she is living in another city. When you want to gift money to your sister/brother at specific occasion say at birthday or anniversary. To provide financial support to your parents in retirement. When you want to enjoy duel benefit of regular cash flow and long-term wealth generation. I hope you have got a complete understanding of SBI Bandhan SWP Plan. If you have any query do post it in the comment section. I am Raman Chandrashekaran, age 55 , retired , wife is house wife and only one daughter doing her final year UG in CS at Binghamton , I want to know can I invest in this SBI BHANDHAN and get the SWP in my wife name and my daughter name if we have a joint account and myself being the first holder ? If so , which SBI MF DIRECT I should invest ? If not as in if joint account is not allowed then if I gift the entire SWP in my wife name where in which she has a separate account , will she has to pay income tax ? You can invest in SBI Bandhan SWP on your name and keep beneficiary as your wife and daughter. Beneficiary should be resident of India. As far as tax rules are concern, payout to them will be gift hence they need not to pay any income tax. However, if they reinvest payout amount they have to pay tax on interest earned. You can select any SBI open ended growth direct or regular plan. Some of the good plans by SBI are (1)SBI Blue Chip Fund – Direct Plan (G)(2) SBI Magnum Balanced Fund. These funds are advisable for 1-3 years. Based on performance you should evaluate and make changes in your portfolio. I would suggest two funds as it gives you diversification benefit and helps you to divide risk.